Private Jaccuzi® weekend	From 1 day & 1 night. Complimentary services: luggage service, free access to the panoramic indoor and outdoor hotel swimming pool (according to opening hours), free WiFi within the Hotel complex. Types of hotel rooms: room with terrace, Deluxe Park view room, Junior suite (55 m2), Suite (66 m2) or Presidential Suite (120 m2). Care treatments à la carte: in addition to your weekend spa package, book some treatments à la carte (massages, beauty care treatments, dietetic consultation, sports activities,...). Private VIP Jacuzzi area (for 1 or 2 people): Sensorial shower, Turkish Baths, Sauna, Jacuzzi®. Free access to the Vichy Thermal Spa relaxation area: Vichy thermal water giant bath, hammam and saunas, ice fountain, cold water bath for legs, organic herbal teas and Vichy Célestins mineral water available, cardio-training area. PRICE PER PERSON AVAILABLE FOR 2019. Best price guaranteed: 1 day & 1 night. From €237 per person. Private VIP Jacuzzi area (for 1 or 2 people) + Thermal Spa Pass + Deluxe Thermal Spa view room (2 people minimum) and Half board. Our prices include sales tax and exclude tourist tax (€2.50 per day and per person) and extra treatments and services, upon availabilities. Ideal for a moment on your own, or for two! ARE YOU SEARCHING FOR A ROMANTIC GETAWAY or for a relaxing break on your own? 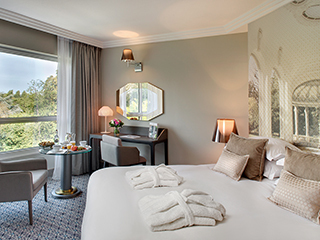 Come to the VICHY CÉLESTINS SPA HÔTEL for a wonderful time in an elegant and refined atmosphere. Relax yourself in the Europe's largest Spa of 7 500m2 whose peaceful and elegant surroundings will delight you! Discover our Vip area with private Jaccuzi®, new for 2017, equipped with a sensorial shower, Turkish bath, sauna and a Jacuzzi. The whole experience is exclusively reserved for you. Ideal for a relaxing break on your own or for two. Recommended as part of the recuperation process to relax your muscles after physical exercise.